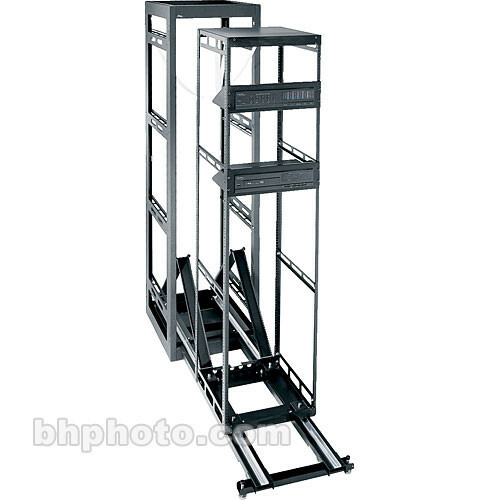 This Middle Atlantic AXS System for Steel Racks MRK-4031AXS-26 provides the stability of the MRK-Series rack frame hosted within a pull-out frame for added mobility. Place racks side by side or back to back for more efficient use of space. It features a fully-welded, steel construction with 37U capacity designed to hold 19" wide equipment. The steel frame and mechanically locking corners provide a weight capacity of up to 650 lb. This enclosure is also seismic certified to protect up to 470 lb. of essential equipment when used with the MRK host cabinet in conjunction with MRK-Z4 brackets. The rack comes standard with (2) pairs of fixed-position, 11-gauge threaded, 10-32 rackrails with EIA spacing and labeled rackspace increments. Electrical knockouts on rear plates (both top and bottom) can easily be removed to pass cables (includes 1/2", 3/4", 1" and 1-1/2" openings). This model also features a configurable, open top with a UHF/VHF knockout. And customization is a snap with a wide-array of practical accessories to meet your exact needs. Protects up to 470 lbs. of essential equipment when used in conjunction with MRK-Z4 brackets. Dimensions (WxHxD) 22 x 76-1/8 x 31-3/8"
Box Dimensions (LxWxH) 82.0 x 35.0 x 27.0"